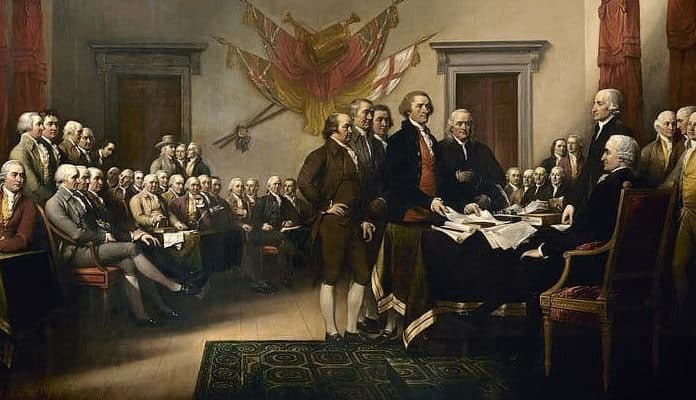 The Founding Fathers, an ambiguous term encompassing those individuals most associated with the formative documents and efforts behind the creation of the United States of America, were an unlikely array of political radicals, professionals, intellectuals, and pamphleteers. Together, they are celebrated as a heroic and selfless amalgam of persons, who collectively ushered into being a nation that would, two hundred years later, lead the world. However, behind the myths and legends, were simply people. Products of their time, flawed, at times incompetent, and prone to all manner of absurdities, it is only right and proper that these individuals are remembered accurately and truthfully rather than reduced to spurious deities as commonly occurs in American schoolhouses across the very country they fashioned. “Scene at the Signing of the Constitution of the United States”, by Howard Chandler Christy (c. 1940). Wikimedia Commons. Patrick Henry, 1st Governor of Virginia, by George Bagby Matthews (c. 1891). Wikimedia Commons. 16. Patrick Henry, the first Governor of post-colonial Virginia, imprisoned his mentally ill wife in the cellar until she eventually took her own life. Patrick Henry, best known for declaring “give me liberty or give me death”, served as the first post-colonial Governor of Virginia. Elected for five consecutive terms, in addition to a further two in the 1780s, Henry was one of the leading advocates of independence during the buildup to the Revolutionary War. However, despite retaining laudatory attributes, less commonly taught is that Henry tormented and abused his first wife, Sarah Shelton, to an inconceivably cruel degree. After the birth of her sixth and last child in 1771, Sarah began suffering from postpartum depression, a fact noted by Henry’s mother who wrote him stating “we feel Sarah is losing her mind after the birth of little Neddy”. As was common at the time, doctors recommended institutionalizing Sarah at the Eastern State Hospital in Williamsburg, Virginia. Aware of the facility’s conditions, Henry, in a supposed act of kindness, instead elected to imprison the mother of his children in the cellar. “Bound in a straitjacket” and “confined in a cellar room”, Sarah was attended by a female slave who attempted, without adequate training, to care for her. In 1775, after four years of imprisonment, Sarah died in captivity; it is believed she took her own life. Rather than acknowledge the effects of his actions, Henry secretly buried his wife in the cellar and remarried in 1777.